Judge Feasel has been a resident of the City of Carlin for most of her life, moving here in June, 1965, when Carlin Gold Mining Company was just beginning to mine gold along the Carlin Trend. She attended Carlin Schools and graduated from Carlin High School in 1972. She has commented that most of her life has been spent in a 2-block radius, encompassing three of the homes she lived in while growing up, in addition to her current residence which she and her husband, Steve, purchased in 1981 at the time of their marriage. Her daughter and grandson are also both graduates of Carlin High School. Judge Feasel has worked in a variety of environments, including the Southern Pacific Railroad for ten years; the City of Carlin Public Works Department; and owning and running a carpet cleaning franchise, Chem-Dry of Elko, for 13 years. She believes her varied experience is helpful in relating to the diverse individuals who come to the court. Judge Feasel has exhibited leadership characteristics throughout her life, including serving as class officer and student body officer while in high school, serving on Carlin’s Economic Development Committee and Carlin City Council, serving as Treasurer and Trustee in the Carlin United Methodist Church, and being a member of an advisory committee while she was involved with the Chem-Dry franchise system. 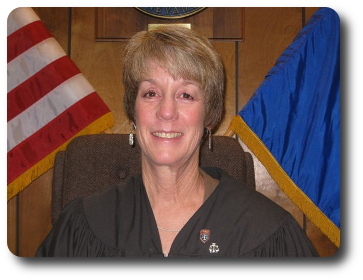 In August, 2007, the Elko County Commissioners selected Judge Feasel to fill the vacancy in the Carlin Justice Court, which was created when Judge Barbara Nethery retired. Judge Feasel began working as Carlin’s Justice of the Peace on September 22, 2007. She was elected in November, 2010, to finish out the original term. In November, 2012, she was re-elected to serve a six-year term which began January 1, 2013. Judge Feasel strongly believes the courts are for the people; the venue where citizens have the opportunity, and the right, to be heard. The opportunity to learn on a daily basis. The chance to have a positive influence on a person’s life. The challenge of the position. It is never boring or mundane. Being an active participant and a leader in the Carlin Community. Serving the residents of the town. All content copyright Elko County Courts, except where otherwise noted. All marks are the property of their respective owners.